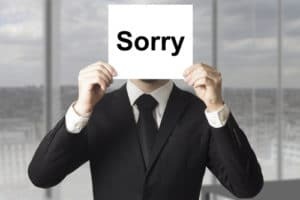 When Should a Leader Apologize for a Mistake? We all make mistakes – even leaders. And when that happens, a leader should just apologize, right? Saying sorry isn’t as simple as all that. As a society, we are sometimes a little too polite. When you miss something that someone said to you, you say sorry. You bump someone in your way, and you say sorry whether or not it’s your fault. You sneeze while someone is talking and you say sorry. Sometimes, our society says it a little too much. So when should a leader apologize for a mistake? When something is genuinely your error, and it has caused someone pain or inconvenience, an apology might be in order. Even if you’re the boss. Remember, finely tuning your social and leadership skills are part of your job. Acknowledging that you’re only human goes a long way. When does proper leadership and management dictate it’s appropriate for a manager, a supervisor, or a CEO to humbly admit he made a mistake? And when is it wrong to apologize? OK, so you screwed up. You wrote down the wrong deadline in a calendar, misfiled an email, or gave your staff member the wrong lead, and it’s caused him to make a mistake too. It all snowballed from something that you’ve done. As the boss, the right thing to do is to own up to your error and take the blame from the higher ups, from peers and publicly acknowledge that it was your fault. The keyword here is publicly. Your employee will commend your leadership skills if you don’t throw him or her under the bus, even if you could’ve just as easily passed the blame to him. Your prediction about the last quarter, or how a new product would fare, was wrong. As a result, the company took a loss and your whole team suffered. Again, as the CEO, it was your responsibility to make the final call. Own up to your mistake. If it’s your fault, and you know you need to say sorry, don’t stall for time. Delaying the apology will only make you look worse. Say it soon, and say it sincerely. Learn from your mistake and let bygones be bygones. If that apology is warranted, again, don’t get defensive. It will only make you look insecure and weak, and set a bad example for your staff. Admit that you were wrong, and move on – your employees will admire you more for it. Examine your week. Is there anything you should apologize for? If there is, man up and do it now. It’s never too late to demonstrate your strong ethic and leadership skills. Let’s say for example that you are the head of communications at your company. Your boss wants you to get three new advertising leads – by Friday. It is now Wednesday night. He doesn’t know that these leads take weeks and sometimes months to cultivate. When Friday rolls around, and you don’t have anything to produce, he flips his lid. If you’ve already communicated that it’s almost impossible to get this done, you don’t owe him an apology. After all, you’re only human, and you can’t work miracles. Apologizing in this case will only make you look worse, because it looks like you’re admitting that you did something wrong, which you didn’t. Scenario: Your boss asks you to do something slightly unethical. Perhaps he’s asking you to alter some data, or do something risky. You believe it’s wrong. You know doing it will negatively impact the company and your reputation in the long run, so you refuse to do it. Don’t apologize. You need to explain what your beliefs are and why you stand by them.